PS: If you click the Download button, you’ll be able to hear it without downloading it. Johannesburg – South Africans have dug deep into their pockets and donated more than R9 million in aid to war-torn Syria. 27/12/2016. Yusuf Abramjee holding the #SAveSyria banner in support of aiding those displaced in the ongoing and very violent civil war that has plagued Syria for a number of years. They were moved by the heartbreaking images of the situation in Aleppo, said Pretoria-based social cohesion advocate and #SAveSyria co-ordinator Yusuf Abramjee on Tuesday. He said he had been inundated with calls from various individuals and organisations since fighting broke out in Aleppo. They said they wanted to help after seeing pictures of dead and injured children. Aleppo is a city in Syria that made headlines in recent weeks after Syrian regime forces retook the city, formerly held by the rebels. Images of thousands of people, including children, caught in the crossfire have emerged, and this encouraged South Africans to take a stand and support them. “Exactly 11 days ago I was inundated with calls from various individuals and NGOs saying the images of Aleppo of the dead children were heartbreaking, and asked if there was anything they could do as South Africans,” according to Abramjee. He said he immediately began calling his activist friends to do something to help the people of Syria. This effort has seen Abramjee join hands with former public protector Thuli Madonsela, and together they are raising money for relief. Madonsela also worked with Abramjee on #OperationHydrate during the height of the 2015-2016 drought, which affected large parts of the country. The campaign collected water from wetter areas and sent it to areas that had become parched from the intense heat and lack of rain. “We asked South Africans to start pledging online, and we received R250 000 worth of pledges. During those four hours people pledged R10.2 million, which will be given to seven charities chosen to use the money and their skills to aid Syria. Abramjee said this was “ubuntu in action”, where South Africans young and old disregarded their own financial standing or economic situation to extend a helping hand to those in need. He spoke of children donating their pocket money as well as a family in Laudium, Tshwane, who did not want to be named, who chose to forgo their holiday and instead donated the money to #SAveSyria. The campaign will give six charities R1m each on Wednesday, while the Al-Imdaad Foundation will receive R3.6m as a special request from the Polokwane community. Madonsela will address the charities during the handing-over ceremony. “We don’t want a rand to go towards salaries, travel, commission, etc,” said Abramjee. The charities would have to explain how they intended spending the money. He also said they would be donating a container with clothing, sanitary towels and food to Syria, with another one being sent next month. The money from the on- going pledges would be given to the seven charities to further their aid efforts. “We will also be going to Syria for a fact-finding mission and to see where all the donated money went,” said Abramjee. The foundations involved are Jamiatul Ulama SA, Africa Muslims Agency, Jamiatul Ulama KwaZulu-Natal, Darul Islam Relief Fund/Muslim Judicial Council (SA), Islamic Relief SA, Al-Quds Foundation and Al-Imdaad Foundation. More than ten million rands has been raised by OperationSA, in a bid to reduce human suffering in war-stricken Allepo in Syria. The battle for Allepo has left many of its people devastated, touching the hearts of well-wishers in South Africa. 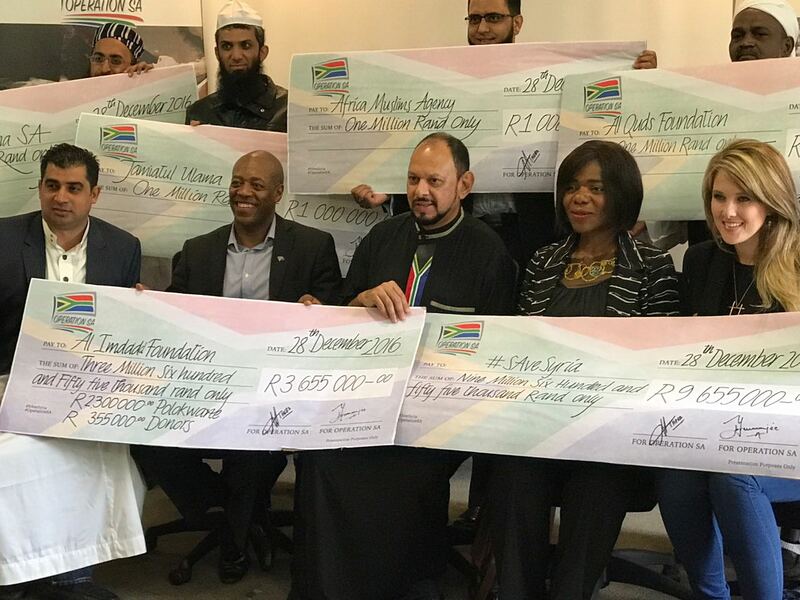 JOHANNESBURG- Almost R10-million was presented to seven charities today by #OperationSA for the #SAveSyria humanitarian efforts. was pledged as at 8am today. Abramjee told the seven charities that the money had to be used for humanitarian aid only. “We don’t want one rand to go towards salaries, travel, commission, etc. “There is a desperate need for food, medicines, clothing, blankets, shelter, etc. We want to also ensure that the aid reaches the people of Syria without delay,” Abramjee said. Six charities received R1-million each. They are the Jamiatul Ulama SA, Africa Muslims Agency, Jamiatul Ulama KZN, Darul lslam Relief Fund/Muslim Judicial Council (SA), Islamic Relief SA and the Al Quds Foundation. The Al-Imdaad Foundation was presented with a cheque of R3,655 000. The Polokwane Muslim Trust Welfare Fund donated R2,3m. Two other donors also requested their funds for the Foundation. A total of R9 655 000 was paid to the charities. The balance will be hand over in January once all the money pledged is in. Representatives from the organizations thanked #OperationSA for mobilizing at very short notice and for raising the millions of rands. They said #OperationSA united NGO’s. Yaseen Theba from #OperationSA said everyone from NGO’s to Womens’ Groups, companies, individuals and school children have donated. “We have seen South Africans from across the spectrum donating. This money is going to go a very long way to assist the people of Syria,” added Theba. Former Public Protector Thuli Madonsela has also thrown her weight behind #OperationSA. She said “the biggest mistake we can make is doing nothing” and has placed her full support. She was also announced as a patron of #OperationSA. Scores of young children, some donating their spending money, also called-in to the pledge lines last week. A Pretoria family, who did or want to be named, even cancelled their planned holiday to donate to #SAveSyria. Al-Imdaad’s Projects Coordinator Qari Ziyaad Patel said: “Our teams on the ground are ready to facilitate the relief efforts on behalf of #OperationSA and with the experience and transparency we have it will indeed be and eye opener for the group. A container filled with essential items such as food and clothing left Johannesburg today. The Al-Quds Foundation said a second container was being prepared for January. Johannesburg – More than R7 million has been paid to the #SAveSyria #OperationSA fund within five days. #OperationSA launched the drive earlier this week in response to calls to help with humanitarian efforts in Aleppo and other parts of war-torn Syria. “The response from South Africans has been overwhelming. We are continuing to get pledges online and via SMS,” said #OperationSA founder Yusuf Abramjee. 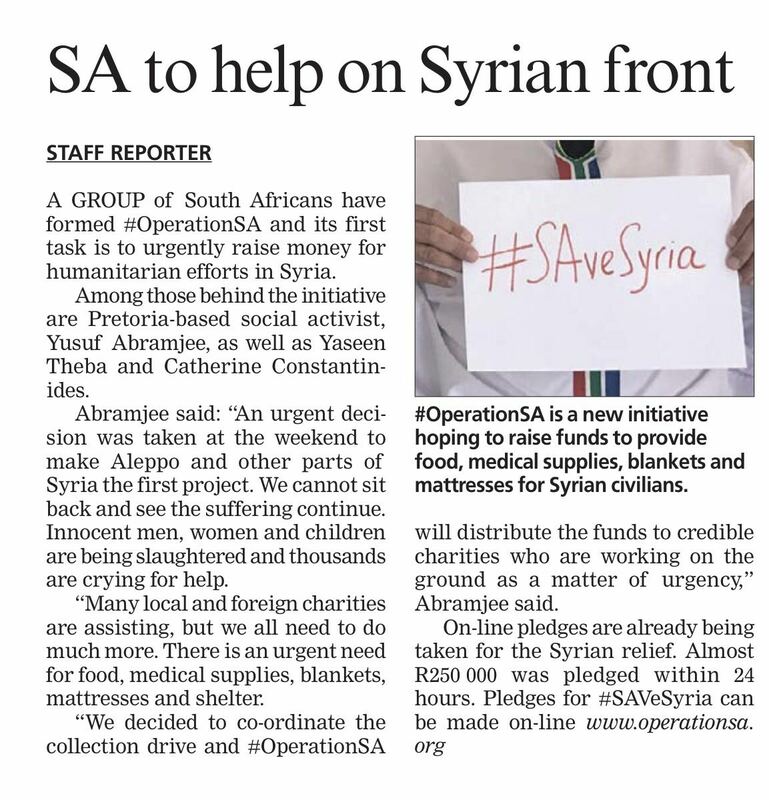 The #SAveSyria #OperationSA campaign was launched following calls to assist victims of the Syrian conflict. Abramjee with fellow social activists Yaseen Theba and Catherine Constantinides are among those behind #OperationSA. The pledge line saw almost 800 callers and thousands of SMS’s. The biggest single pledge was R2,3 million was from the Polokwane Muslim Trust Welfare Fund for the Al-Imdaad Foundation. It has already been paid into the special fund. Scores of young children, some donating their spending money, also called in. A Pretoria family, who did not want to be named, even cancelled their planned holiday to donate to #SAveSyria. The money is to be distributed to seven local charities who are doing humanitarian work in Syria. They are the Al-Imdaad Foundation, Africa Muslims Agency, Jamiatul-Ulama SA, Jamiatul-Ulama KZN, Al-Quds Foundation, Muslim Judicial Council and Islamic Relief SA. The Al-Quds Foundation is preparing a container with food and clothing and it is scheduled to leave Johannesburg on Wednesday. “We are witnessing ubuntu in action yet again. The response from the public has been amazing and we will ensure that every rand raised is used for humanitarian relief such as food, blankets, medicines and shelter,” added Abramjee. He said “it was not only Muslims who were donating. People from all sectors of society are digging deep into their pockets. “If one person suffers we all feel the pain. It is our duty to help those in need irrespective of religion, nationality or race. We are all human. “The pledge recall rate is brilliant. We almost have 50% of the money in within such a short space of time. I have not seen such a response in all the years of charity and community work,” Abramjee told the Saturday Star. He said “we were not sure how much money will come in because we are in the middle of the holiday season. “The phones did not stop ringing. The shocking images from Syria also prompted many callers to donate. The almost R14m raised in such a short period of time shows we are a caring nation,” said Theba who directed the Call Centre Operations. Donations can also be made via Whats App and SMS: 072 3 99 99 99. “We will not allow money donated to be used for salaries, agents fees and admin costs,” said Abramjee. Abramjee and Theba were part of the team that founded Operation Hydrate earlier this year. The civil-society group donated millions of liters of water to drought-stricken communities. Abramjee is also Chief Ambassador the CEO Sleepout SA. This year they donated R9m to three charities involved in education. Over R20m went to Boys and Girls Town last year. “Our mission in life should be to help others in need and create a better world,” he said. In partnership with the Al-Imdaad Foundation, Abramjee and the Operation Hydrate team also drilled boreholes in many parts of SA. Al-Imdaad’s Projects Coordinator Qari Ziyaad Patel said : “Our teams on the ground are ready to facilitate the relief efforts on behalf of #OperationSA and with the experience and transparency we have it will indeed be and eye opener for the group. As at 10am on Friday 23 Dec 2016, R7,732,273.22 of R13 626 937 pledged has been paid into the #SAveSyria bank account. This amount includes R2,3m from the Polokwane Muslim Trust Welfare Fund for the Al-Imdaad Foundation. #OperationSA thanks all the donors for opening their hearts. *Must mention Zakaat, Lillah or Sadqa. #OperationSA is planning to distribute the money raised before the end of next week. The money is to be distributed equally to seven local charities who are doing humanitarian work in Syria. They are the Al-Imdaad Foundation, Africa Muslims Agency, Jamiatul-Ulama SA, Jamiatul-Ulama KZN, Al-Quds Foundation, Muslim Judicial Council and Islamic Relief SA. #OperationSA has made it clear that the funds raised are exclusively for humanitarian efforts and are not to be used for salaries, agents commissions, travel or unrelated costs. Johannesburg – South Africans showed their spirit of Ubuntu again on Tuesday night when the #OperationSA organisation hosted a live telethon in Joburg, in an effort to raise money for humanitarian relief in war-torn Syria. 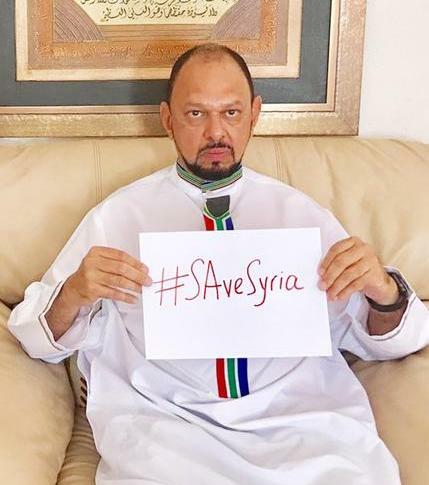 #OperationSA was formed by social activists Yusuf Abramjee and Yaseen Theba, among others, in reaction to the plight of Syrians experiencing hardships as war rages between President Bashar al-Assad’s forces and rebels seeking to overthrow the Assad regime. During the live broadcast of the telethon, both Abramjee and Theba stressed that they could not sit back and do nothing while their fellow humans in Syria suffered because of a senseless war. “We know what is happening [in Syria] – men, women and children are being slaughtered. How can we as South Africans sit back and watch the blood continuing to flow? It’s heartbreaking,” Abramjee said. He contended that the rest of the world has largely sat back and done nothing to assist Syrians, saying South African should draw on their spirit of Ubuntu. “We, in South Africa, in the true spirit of Ubuntu, have decided to unite under the banner of #OperationSA and to really make a difference. There’s an urgent need for food, medicine, blankets, mattresses and shelters,” Abramjee added. The first caller on the telethon was a young girl from Pretoria, Amina, who pledged R5 000 to the relief efforts, saying she also wanted to play her part. Abramjee emphasised that every cent which is collected will go towards Syrians in need, and their organisation will make sure that the intended beneficiaries receive the funds. “The chief executive of ITV, the channel which hosted the telethon, and myself will be travelling to Syria over the next two weeks to ensure that every cent that you are donating tonight is well spent,” he asserted. After roughly one hour and 15 minutes after the telethon began, Theba announced that they had managed to raise over R1.2 million from pledges throughout South Africa and outside of South Africa. Beneficiaries of this initiative include the Al Imdaad Foundation, Islamic Relief SA, Africa Muslims Agency, Jamiatul Ulama SA and Jamiatul Ulama KZN. There are also a number of smaller organisations which will benefit from this initiative. People can continue to make pledges on http://www.operationsa.org/. A pledge line by the five-day old NGO #OperationSA to assist with humanitarian efforts in Syria raised R 10 028 953.00 within five hours. The #SAveSyria campaign was launched at the weekend following calls to assist victims in Aleppo and other parts of war-torn Syria. Social activists Yusuf Abramjee, Yaseen Theba and Catherine Constantinides are among those behind #OperationSA. The pledge line on ITV channel (DSTV 347) and several radio stations saw almost 800 callers pledging. The biggest single pledge was R2m from the Polokwane Muslim Trust Welfare Fund. Scores of young children, some donating their spending money, also called-in. “We witnessed Ubuntu in action yet again. The response from the public has been amazing and we will ensure that every rand raised is used for humanitarian relief such as food, blankets, medicines and shelter,” added Abramjee. “The phones did not stop ringing. The shocking images from Syria also prompted many callers to donate. The over R10m raised in such a short period of time shows we are a caring nation,” said Theba who directed the Call Centre Operations. Abramjee said a delegation was planning to visit Syria soon “to look at conditions and the relief work underway.” The Al-Imdaad Foundation is co-ordinating the visit. Innocent men, women and children are being slaughtered. It’s time for the world to stand up and assist. South Africans are uniting and we appeal to our viewers to join-in. soukISLAM is joining OperationSA to raise money for humanitarian efforts in Aleppo and others parts of Syria. 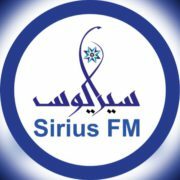 Join us on Tueday evening 20 December 2016 from 7:30pm to 11:30pm Central African Time together with ITV, Radio Islam, Radio Al Ansaar, Voice Of The Cape, Deen TV, Sirius FM and others. Jamiatul Ulama SA, Jamiatul Ulama KZN, Al Imdaad Foundation, Islamic Relief SA, Awqaf SA and a number of other organisations.